Then during the 1920s prices rose almost 3% yearly in real terms. The depression saw real prices drop in half, and the 1940s saw them slightly more than fully recover. Real prices dropped about 2% yearly from 1949 to 1969 and then rose 3% yearly from 1969 to the famous peak in property values of 1989. From 1989 to 1999 prices dropped in half – again adjusted for inflation. Note in the above chart that when you adjust prices for inflation, current prices are actually lower than the peak set in the late-80s. Chart technicians would draw an inference from this: "lower highs and lower lows," meaning that the next low in the Manhattan real estate market would be significantly lower (in both nominal and real terms) than the last low. 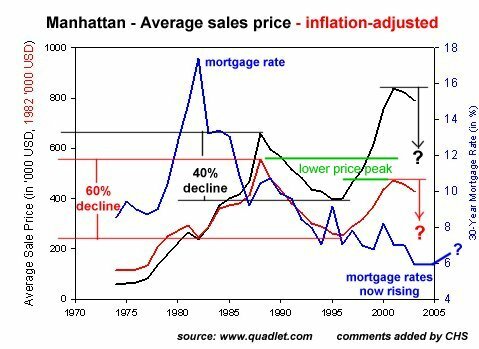 If we extrapolate from history--and we do have 100 years of data--then we can expect Manhattan property--yes, every "prime" square inch of it--to decline 40% to 50% in nominal terms and from 50% to 60% in inflation-adjusted terms. Any way you slice it, that's serious money being lost. Here is the link to the source of the above chart: Are Real Estate Prices Dependent on Mortgage Rates? This data begs one nagging question: if "prime real estate" is set to drop in half, then how far will less-than-prime real estate drop?